Lexi Home 16 Pcs complete home bar accessories set is great addition to your home. They are made out of high quality stainless steel material for extra durability and stain or odor prevention. Bartender set comes with 2 cocktail shaker tins (750 ml and 500 ml), a double jigger, bar spoon, Hawthorne bar strainer, metal bottle opener, 6 liquor pour spouts and 4 shot glasses. 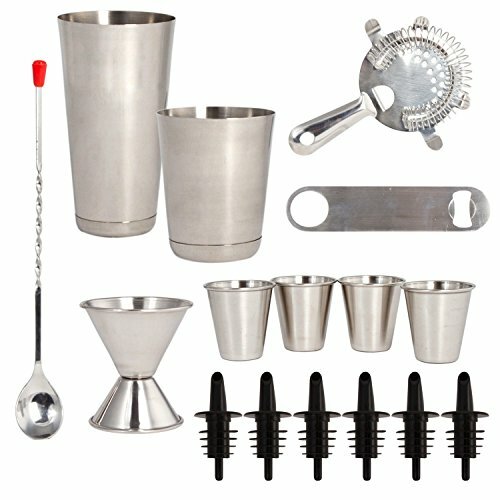 Bar mixer set is great for any cocktails and it can be used at home or professionally in a bar. All Lexi Home products come with no questions asked absolutely 100% money back guarantee, and so go ahead and grab one. COMPLETE HOME BAR SET: 16 Pcs Home bartender set comes with all essential bar accessories; 750 ml and 500 ml bar shaker set, a hawthorne strainer, double cocktail jigger, a Flat bottle opener, 6 pour spouts, 4 stainless shot glasses, and a metal bar mixing spoon. LOW PRICE AND CUSTOMER SATISFACTION - Low low price, highly-rated customer service, guaranteed satisfaction and hassle free returns. If you have any questions about this product by Lexi Home, contact us by completing and submitting the form below. If you are looking for a specif part number, please include it with your message.